One of the reasons why Yo Amo Colombia is because of the food. 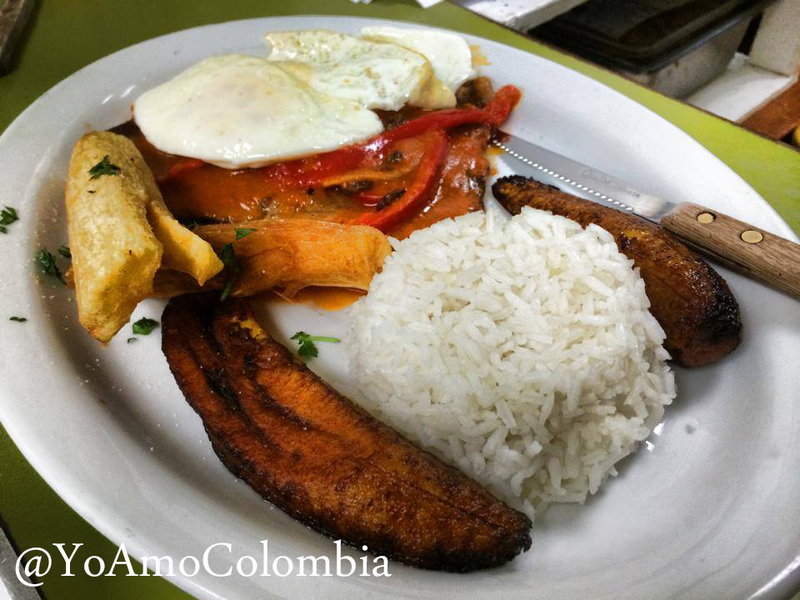 When you travel to Colombia or visit a Colombian restaurant in the states, you will see some of the most diverse foods served onto one plate. Each region of Colombia has its own personal and unique dish. Colombian food is filled with flavor, and made up of different cultures such as Arab, Spanish, and African as well as the indigenous Colombian culture. Most of Colombian dishes have been handed down from generation to generation, which for me makes it extra special. This list of Colombian Food: Dishes You Must Try is a list of popular main dishes that you can find at any Colombian restaurant and some of them are my personal favorites. Please comment below if I missed your favorite Colombian cuisine dish because I will be writing a part 2 of Colombian Food: Dishes You Must Try. 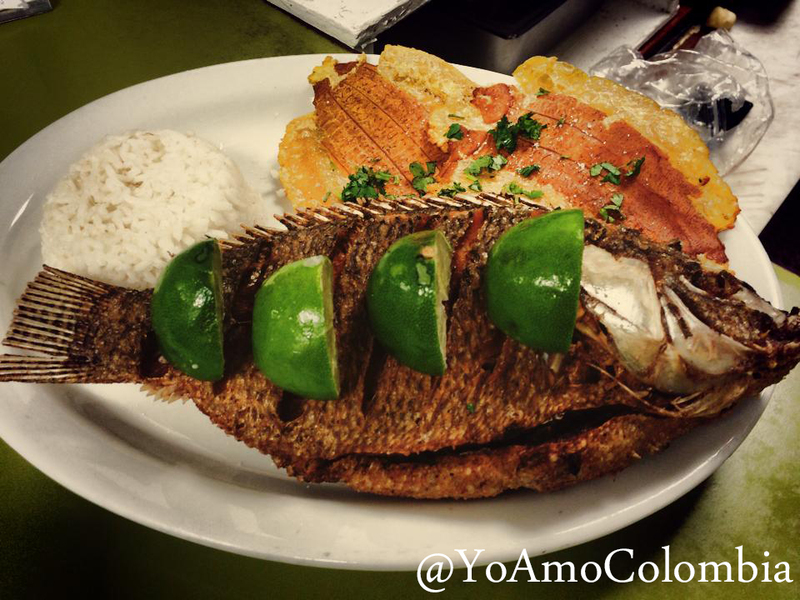 This monster plate of food is the national dish of Colombia. It comes from the Antioquia region but it served and known all over Colombia. The plate includes: Rice, Beans, Carne Molida or Asada, Chorizo, a Fried Egg, a Slice of Avocado, Fried Sweet Plantains (Platano Maduro), Chicharron, and lastly an Arepa. This combination of food can be very strange at first sight but so delicious at first bite! Caballo? Isn’t that Spanish for horse?… Yes it is, however it does not mean a plate of horse meat. This confusion always occurs but trust me we will not serve you any horse meat. Bistec a Caballo is probably one my most favorite Colombian food dishes. This dish is made up of a piece steak smothered in Colombian Hogao (tomato and onion sauce), served with rice and yuca frita. Some places will add raisins to the sauce which will make your taste buds go wild! More soup! 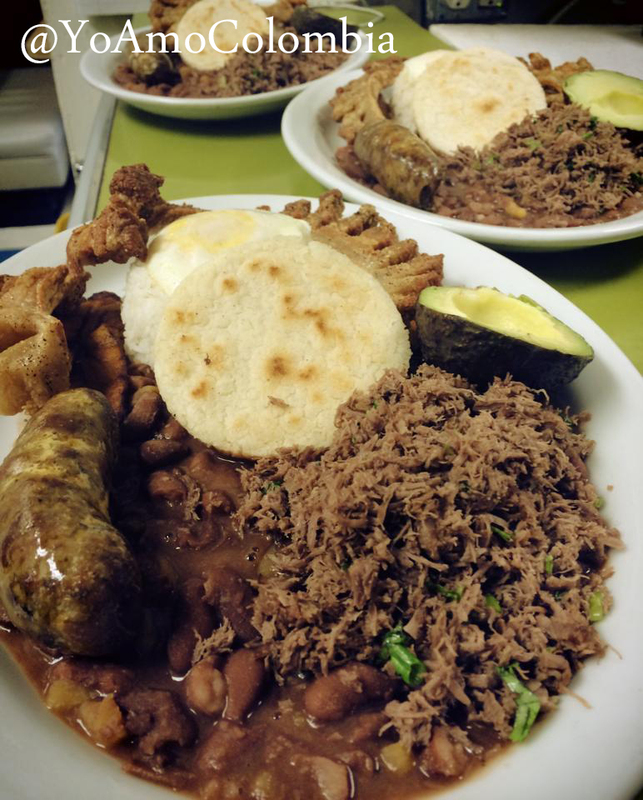 Another excellent Colombian food that can be used as a cure for your hangover. 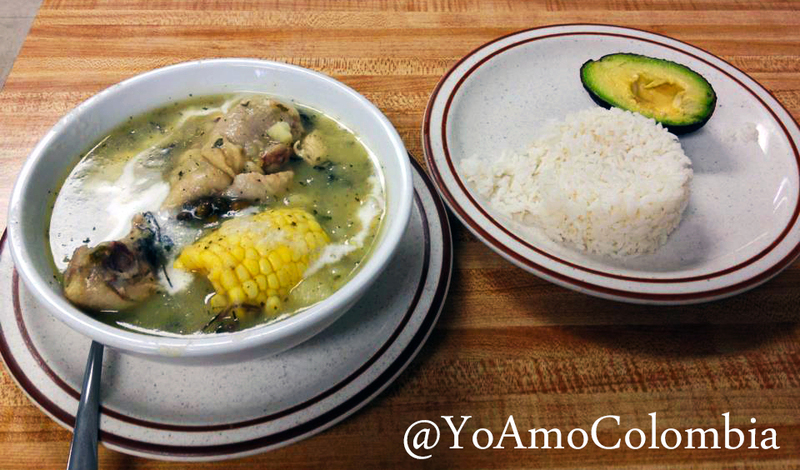 The Ajiaco soup is a way different from the Sancocho. This soup is heavier, meaning it is not so brothy. 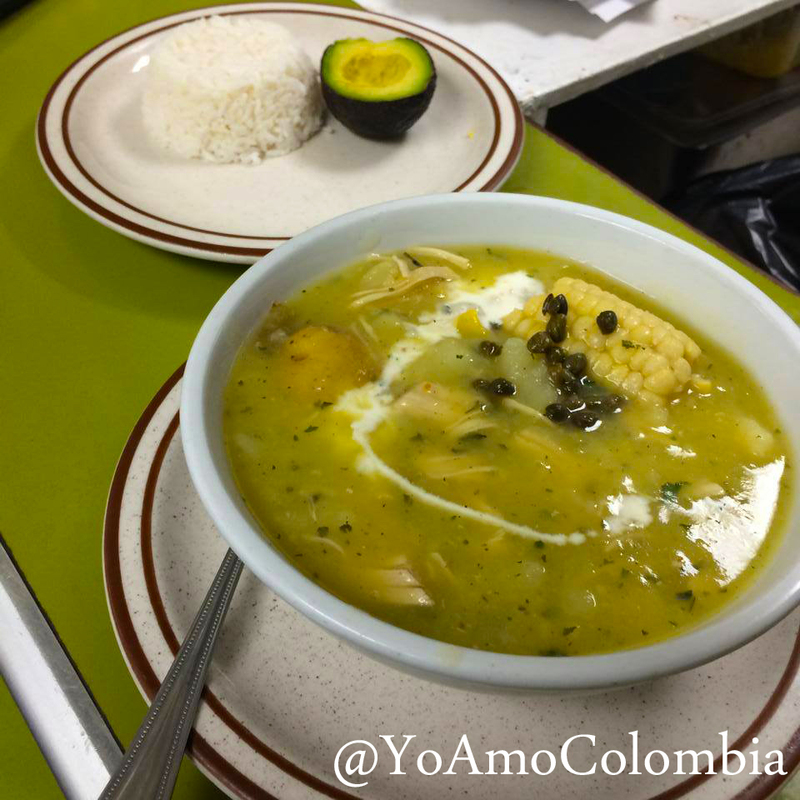 Ajiaco is made up of three different potatoes, either shredded chicken or leg quarters of chicken, a piece of corn on the cob, guasca, capers, and sour cream. Served with rice and avocado. 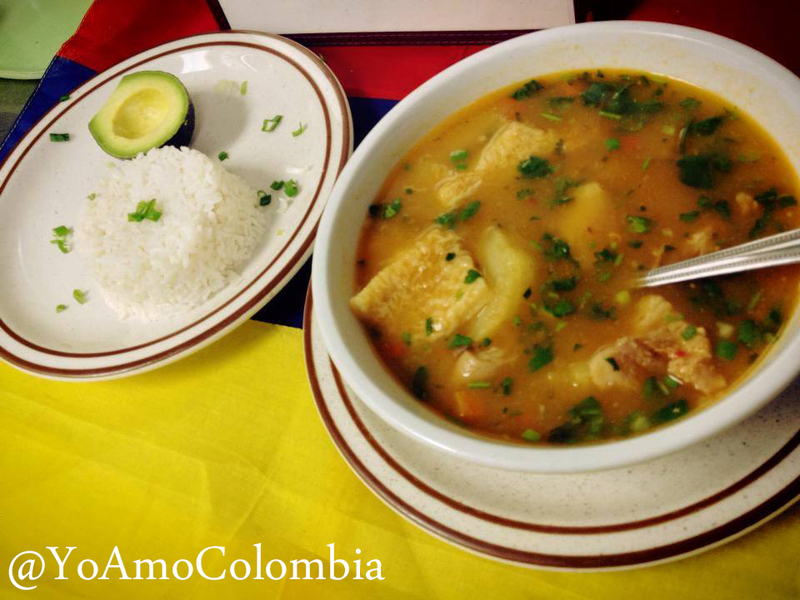 Ajiaco is a personal Colombian food of mine and a definite must try! Don’t think this post was all about lunch and dinner. Calentao is a traditional Colombian breakfast. Basically Calentao is whatever leftovers you had from last night for dinner reheated and mixed together, with a fried egg on top and an Arepa. Now that is the home version of Calentao. If you go out to a restaurant in Colombia and order a Calentao they will serve you a plate of rice, beans, 2 fried eggs, your choice of either carne asada, chicken, chicharron, chorizo, or pork, and arepa with cheese. Served with hot chocolate, coffee, or a natural fruit juice. To be honest, I thought this was the strangest Colombian food when my dad first served me this. Changua is a breakfast soup that comes from Bogota (where my dad is from). You can only get Changua in Bogota, however I also believe it is known in other cities of the Cundinamarca department. Do not try to go to Medellin and ask for the Changua because they will look at you with a confused look on their face. So what is it? 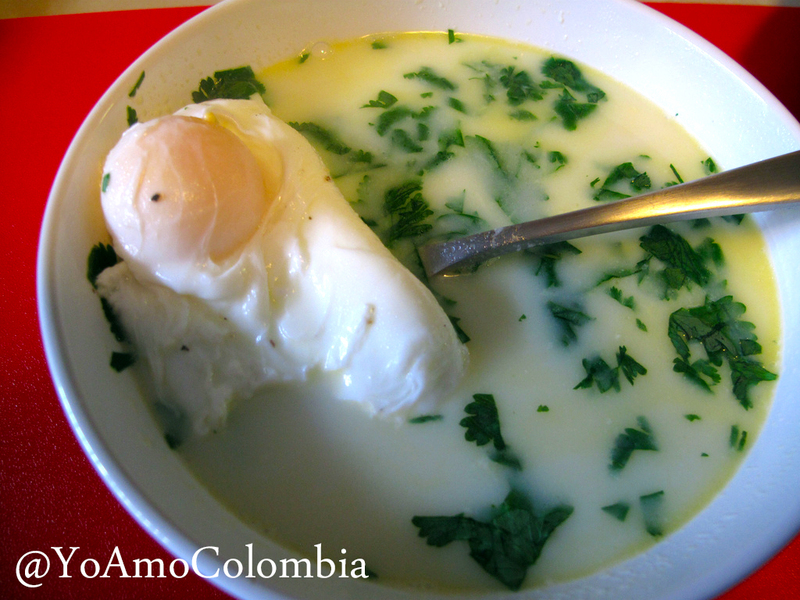 Changua is a milk soup with chunk of potatoes and either one or 2 poached eggs in it. Garnished with green onions, cilantro and toast. I know – it sounds very weird – but it taste great and I could not leave it out my must try list. Cuisine from the Colombian coast. I love visiting the coast especially during Carnaval in Barranquilla. I make sure to order this whenever I visit the coast. They take a whole Mojarra (Tilapia) stuff it with onions and bell peppers and deep-fry it. Then it is served with salad, patacones, arroz de coco (coconut rice) and slices of lime. I recommend washing it all down with a natural fruit juice or a ice cold coconut lemonade. You probably thought when in the world was this going to show up? Here it is, Arroz con Pollo. A very traditional Colombian food dish that can be found just about any where in Colombia. The dish’s name is pretty much self-explanatory, it is shredded chicken mixed in with yellow rice, peas, carrots, onions, and sometimes tomatoes. 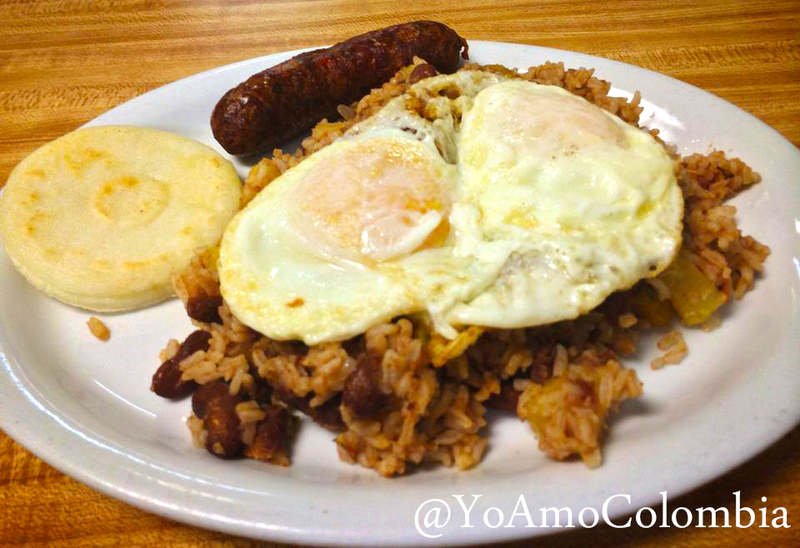 Served with a side of platano maduros and either a fried egg or a hard-boiled egg. We also like to add ketchup to the food and mix it all around. I love tamales, especially the Colombian ones. I love them more than Mexican tamales. Colombian tamales are bigger and contain more meat. Here in Colombia we have two different types of tamales that come from two departments, Antioquia and Tolima. We have the Tamal Tolimense and the Tamal Antioqueño. The difference between the two is that the Tolima tamal has rice inside and the Antioqueño one does not. Both are filled with potatoes, carrots, onions, peas, chicken, and pork. All of this is wrapped up in banana leaves. Often times served with rice and arepa. The great thing about these tamales is that they are served for breakfast with hot chocolate especially during December. These tamales are a Colombian food must try. Mondongo! Famous in the Antioquia region and known around Colombia as well. Mondongo is a tripe stew -similar to the menudo from Mexico – Mondongo contains pork meat, tripe, chorizo, and potatoes. Garnished with cilantro and lime juice, and served with rice, avocado and banana (again I still do not understand the whole banana thing.) It’s a constant battle for me whether to chose Mondongo or Ajiaco, however Mondongo definitely deserves a spot on this must try list. Lastly, we have Lechona. This traditional Colombian food is commonly eaten in December. 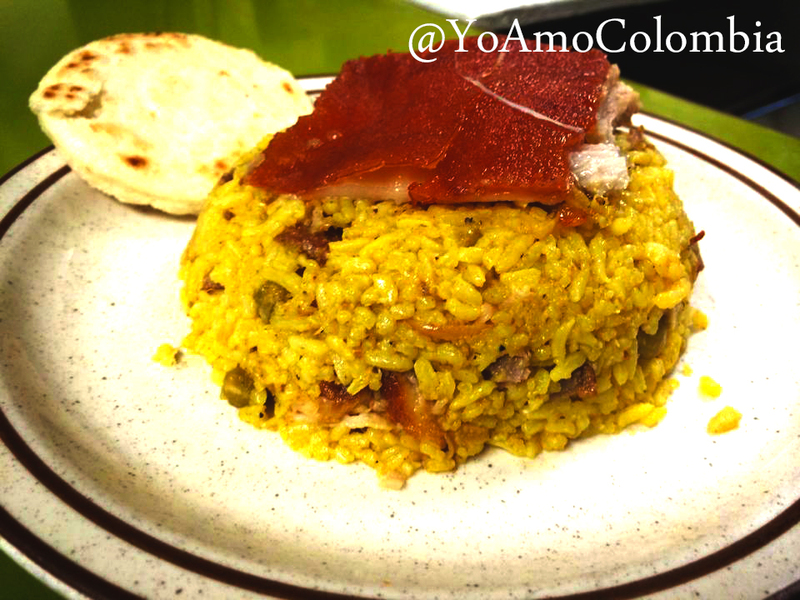 It is almos the same as the Arroz con Pollo, instead of chicken we use pork. 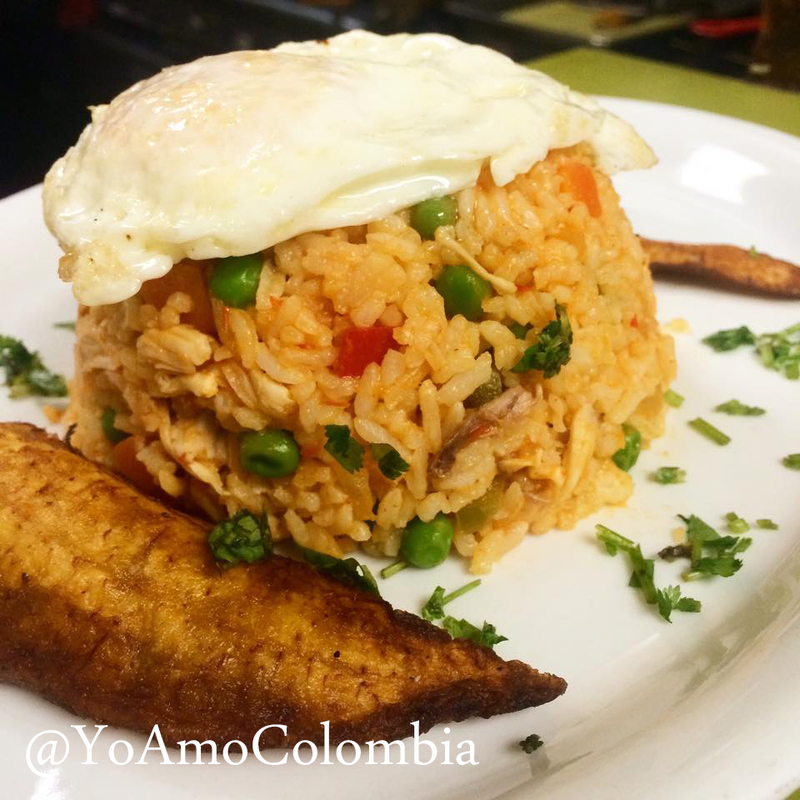 It is a huge mix of rice, peas, carrots, onions, and pork served with a sheet of of pork skin and arepa. You will definitely will want to try a plate of Lechona when you visit Colombia and especially during Christmas time. There you go! 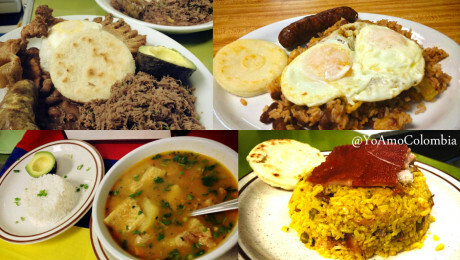 These are Colombian foods you must try. I know there are a couple of missing, but do not worry, because I will write a part dos later. If you plan on visiting Colombia (which you definitely should) or are going to eat Colombian food for the first time, I would recommend trying any one of the above dishes. Now excuse me, all this writing about food has made me hungry and I am in the mood for some Mondongo! Hi there, I am Francisco Macia and welcome to the Yo Amo Colombia Blog! This blog shares helpful travel tips and guides for anyone that is interested in visiting Colombia. I have been living in Colombia for 3 years and absolutely love life here. Please feel free to ask any questions. Medellin Buzz – My brother’s blog about living in Medellin. Colombian Real Estate Photography – Amazing real estate photography of Colombia’s finest penthouses and luxury apartments. Photographs are done by my great friend Joel Duncan. Plan your best bro’s bachelor party using this Medellin bachelor party guide.